The benefits of caviar, nobody doubts, Well, and its savory taste qualities conquered and continue to conquer the palates around the world. 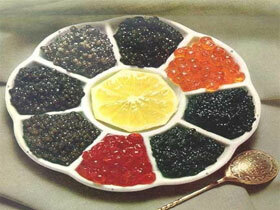 caviar varieties is very much, and most of them are considered delicacies types, subdivided into black and red. But beyond that now they have become popular and are successfully used in cooking the eggs of some river fish. Most often, this product is most people buy already processed form, but if you want to pickle eggs and can be at home. Caviar home salting, if it was cooked correctly, turns out much tastier and healthier, Its only disadvantage is much less shelf life. 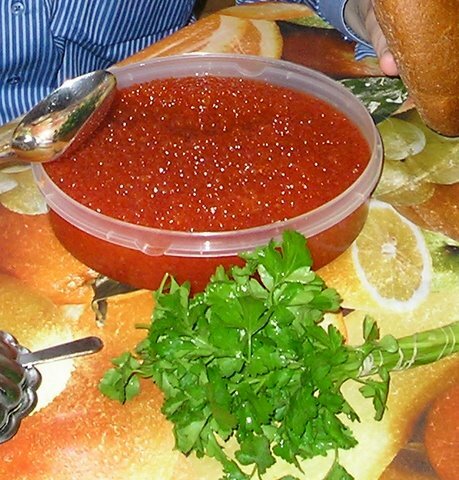 Red caviar - it's eggs, fish belonging to the order of salmon. In Russia, it has become harvested and served as a delicacy in the early twentieth century. Yet while people knew, that the correct salting it depends not only taste quality, but also the duration of its storage. Before, how to start salting, should prepare eggs, namely, to remove them from the fish, and carefully remove the protective plenochku, in which they are located. For the first method you will need a plug, deep dish and your skill. Take the eggs in a film bag and lay it into the prepared dish, then gently engages the film reel fork and tried it on the teeth of the cutlery by rather vigorous rotation. The deletion of the film needs to be done very carefully, so as not to damage the eggs. This method is more suitable for river fish, since the film, preserving eggs, in their most delicate, but, Consequently, less strong. This method is considered to be one of the easiest. For him, take the saucepan, pour it into water, so that it can cover the bags with caviar, that afterwards we put there, and heats it to a hot state, tolerant Hand. Then carefully laid into the container with the liquid spawn untreated hands and gently remove from it the film. Then move the eggs in a colander, washed with cool running water to drain and give. For the third method, you must first freeze eggs, Then in a frozen form, it is placed in a colander and pour hot water. After this procedure plenochka should easily withdraw from eggs. This method is perfect for marine fish, obladatelnitsy thicker film. Using this technique, the film is separated as follows:. Contaminated eggs is put into a deep dish, and is filled with cold water. Ten minutes later a cup of water can be drained and carefully cleaned it from the film bag. This method also takes frozen eggs. After that, an incision is made in the wider part of the protective bag of the eggs and using non-acute side of the knife or fork contents must squeeze, starting this procedure on the opposite side of the cut made. It is very important to hold tightly the pouch at his beginning, not to let it go at the wrong time. caviar, film-coated, We put in a colander with large holes and doused with boiling water salinity. Then carefully skip eggs through the sieve holes, so that the film remains on the surface. 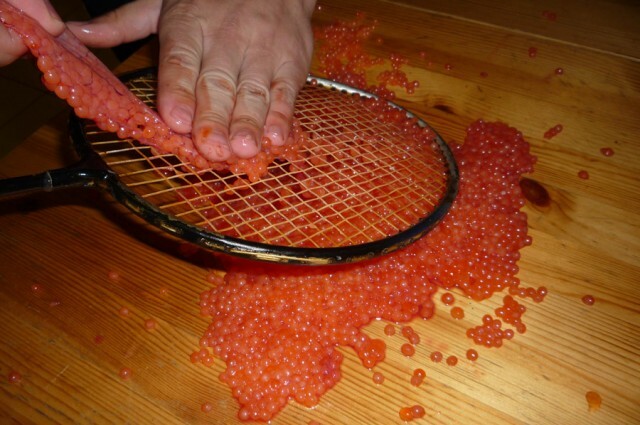 Now consider the detailed recommendations how to pickle caviar fish such as the: trout, salmon, chum and pink salmon. 1 recipe. Prepare the following ingredients: eggs from a single large fish, about 60 grams salt and 30 grams of sugar. Whereupon purified put the film into a suitable pan spawn, add to it the sugar and salt and gently mix all. We give brew fish specialties for a quarter hours, then the product you want to move to the big screen and leave it for a while, until drain excess fluid. In the next phase shifted caviar in a glass bowl, tightly closed with a lid and placed in a refrigerator. 2 recipe. First prepare the marinade. This will require 60 g major non-iodized salt, 60 g and sahara 250 g water. Prepared components are mixed in a small pan, after which the mixture was put on fire, and brought to a boil. Then the saucepan is removed from the plate and the brine is cooled. During this time, you can clean eggs from one medium to the film fishes, and put it in a deep plate. After the brine is cool, fill their main product and leave to infuse for about an hour. After the required time the eggs should be rinsed with cold running water, previously moving it in a colander. This completes the action, as in the previous recipe, Caviar is shifting in a small jar, which also is put into a cooling chamber. 3 recipe. Pickling red trout eggs for this recipe as well as in the previous version, you must first make the marinade. For this to take half a liter of water approximately 140g salt, We mix them prepared for this wide pan. Thereafter, the mixture must be brought to a boil and cool. Then, put the prepared eggs in a small sieve deep, which must be lowered into the prepared saline solution and keeping it there for about three minutes. 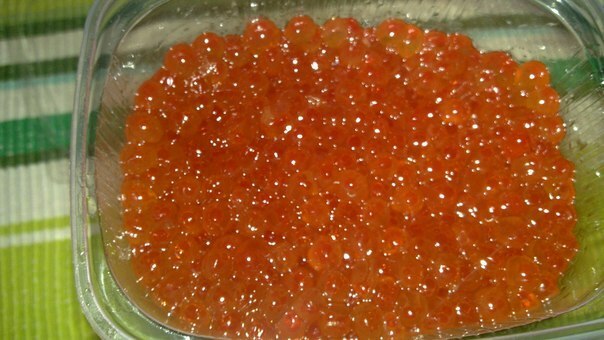 caviar, pickled in this manner, if desired, can immediately enjoy, and the remaining part to pass into a glass pot, then pour it on top of oil and covered with a tight lid, put in the refrigerator. In spicy marinade. To pickle salmon eggs this way, pre-prepare a special marinade. For him, we need to 60 g salt,3-4 Stuff peppers peas, 1-2 middle bay leaf add to a liter of water, stir into the pan and put it on a plate. After the solution boils, remove it from the heat and put to cool in a cool place. 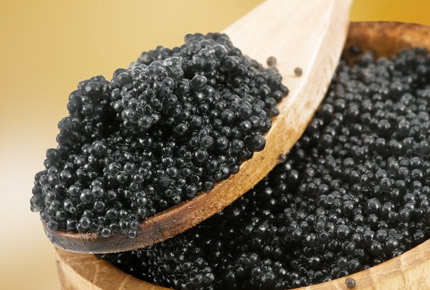 Once the marinade to room temperature, pour it into a cup of harvested caviar, cover with a lid and put them in a refrigerator or other cool place for 24 o'clock. In a special brine. 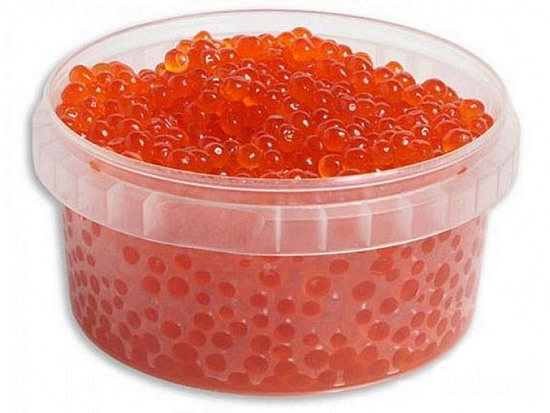 According to this embodiment, in order, pickling salmon caviar, it is not necessary to pre-cleaned, it is only necessary to bags carefully make small incisions. A solution for pickling prepared as follows. The pot and boiled with pre ostuzhennoy warm water until the temperature mean value put purified potato tuber. Then there was added until the salt, while potato will not appear on the water surface. Thereafter the potatoes is removed and the resulting solution was emptied into a cup with caviar sacs, take fork and gently begin to interfere with the mixture, as if beating her, during 5-15 minutes. In this way, Eggs prosalivaetsya and simultaneously cleaned from the film, which is wound on a fork. The mixing time depends on how salty the result you want to get the finished product. In the next stage of caviar shifted first to dry in a colander, and then to advance the gauze, which can then be collected in a bag, tie and hang on for half an hour in a cool place. Dried eggs we shift into sterile jars and put on 5 hours in a refrigerator. Initially preparing a solution for rinsing the pouch with caviar. To this mix in a liter of water half teaspoon salt, boil this mixture, and then cool give. Unrefined grains are put into the prepared solution and washed, cleaning bag from stains. Put the washed eggs in a sieve with large holes or special mesh and mulled it over him, gradually clearing from the film. 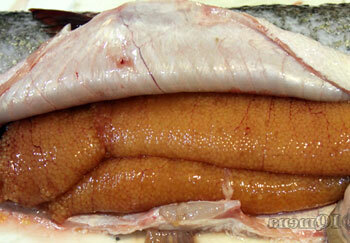 Then, a solution of, which will be salted chum salmon caviar. Take for it not liter of cold water and mix it with 60 g salt. Put in saline solution and cleaned eggs leave approximately impregnated salt 5-7 minutes, periodically stirring spoon. Then, the cup must be emptied with caviar solution and move it to dry on the dishcloth, distributed over its surface. The dried eggs laid in glass containers or jar in the refrigerator and remove. On 0,5 kg eggs take 30 g coarse non-iodized salt and stir. Shift the salted roe in a pre-sterilized jars and added to each tablespoon of vegetable oil. After that, the banks need to roll. 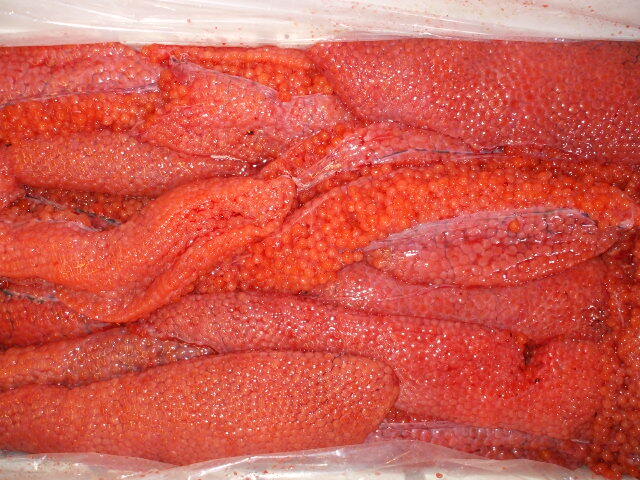 Store salted roe thus possible for at least two weeks. Take fine salt in an amount equal to the relation 0,05 the weight of the most eggs and mix it with her. After which the finished product is salted we shift into sterile jars, so that the eggs are firmly placed in them, clogging the cap and storing them in the refrigerator. Caviar of river fish, as pike, carp, carp, more accessible and appears in the house of every avid fisherman. Therefore, quite often before many mistresses question, what it can do. One of the alternative solutions to this issue will just go and pickle eggs river fish. The methods of salting some of its varieties. At half-liter cans of caviar take 60 grams of fine salt and about 100 grams of sunflower oil. The recovered from their protective bags lay eggs in a bowl or saucepan and adding thereto a salt. Then, whisk, beat the mixture for about an hour before the white chiffchaff. After the salt solution is added to the eggs cooked most of the oil and all carefully mix. Put the eggs in a prepared container, leaving about a centimeter from the edge, top pour the remaining oil and cover with lid. 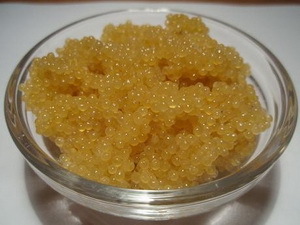 Jars with caviar remove refrigerate. Five days later the product is ready for use. Put the bags with pike caviar in a bowl and pour just boiled water. Mix the eggs with a fork, and gradually separating it from scraping the film. We insist eggs in water until, until the eggs will not accept a yellowish tint, and not separate from each other. After which the water is drained and caviar spread on a cloth or towel to completely dry. Dried eggs again lay in a container, add salt to taste and stir. Then lay eggs in jars, but not too tight and put them in the refrigerator. Before proceeding to pickling, It is very important to extract eggs from fish, since the carp contains a lot of bile, which can get on the eggs at irregular cutting, that will give them an unpleasant taste of bitterness. Taken out bags of caviar should immediately rinse with warm slightly salted boiling water. Then we take a deep container and its bottom sprinkle salt, so that it covered him about 1 cm in height. Vessel with salted caviar is necessary to put in the refrigerator 5 day. After the required time, the eggs will need to rinse off the excess salt and a shift in sterile jars. Despite, that caviar salting can take a lot of your time and effort, still advise to try to pickle eggs alone, since the resulting delicacy is worth it.